Muş Province (Turkis: Muş ili) is a province in eastren Turkey. It is 8,196 km² in aurie, an haes a population o 406,886 (2010 est). The population wis 453,654 in 2000. The provincial caipital is the ceety o Muş (Armenie: Մուշ, Kurdish: Mûs). 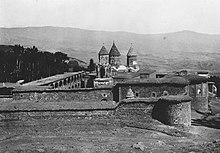 Anither toun in Muş province, Malazgirt (Manzikert), is famous for the Battle o Manzikert o 1071.
the Saunt Karapet Monastery, which wis foondit in the 4t century bi Saunt Gregory the Illuminator an kept the relices o Saunt John the Baptist. It wis destroyed tae its foondations bi the Turkis airmy efter the Armenie Genocide. This page wis last eeditit on 9 Mairch 2013, at 20:57.